The ultimate team-based steampunk airship combat game where six factions vie for control of a world ravaged by machines. Become a Pilot, Engineer, or Gunner in epic PvP and PvE airship battles, with four players manning each ship. Repair your ship’s armor, gun down enemies, and deftly weave in and out of combat to dominate the skies. In Guns of Icarus, you and your crew triumph or perish, together. 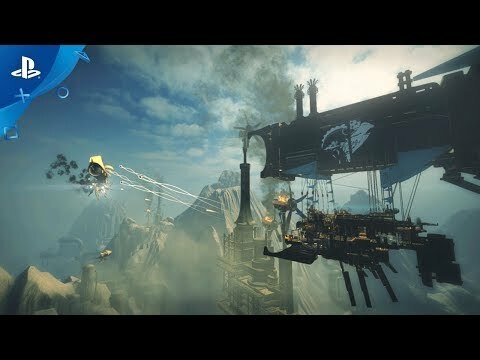 Guns of Icarus Alliance: PS4 Edition is the ultimate player-vs-player/player-vs-environment, steampunk airship combat game, complete with an ongoing war between six elite factions vying for control of a world ravaged by machines. Up to 32 players can join a match for epic airship battles, with four players manning each ship. Or you can team up to take on a devastating AI that learns your habits. In this ever-changing universe, a team’s successes and failures constantly shape and reshape the world based on who dominates the battlefield. Take on the roles of Pilots, Engineers, and Gunners and work with your crew towards victory as sky pirates. Repair your ship’s armor, gun down enemy balloons, and deftly weave in and out of combat to dominate the skies in a variety of game modes and maps. The fastest way to tell your crew to man the guns or repair the hull is through voice chat. Regardless of what platform your crew is playing from — PS4, PC, Mac, or Linux — the game fully supports cross-platform voice chat to help you and your team become a cohesive unit. Pick your ship, from nimble chargers to powerful broadsiders, equip it with a deadly arsenal, and enter the fray. Blast enemies out of the sky with a salvo of rockets, lay traps with strategically placed air mines, destroy their engines with arcs of lightning, or cripple their balloon with a torrent of flames. All things that fly must come crashing down. Assemble a crew and fight the hordes in feverish PvE missions or head to head against other fiendish sky pirates in decisive and strategic PvP combat. Six rival factions are in a constant battle of wills to take and retain territory, and control vital resources. Every victory and defeat will sway the tides of the larger war. After years of isolation, six different factions have developed very different ideas about how this new world should be reclaimed. Select your faction, build a custom airship, assemble a trusty crew and get ready to change the world! 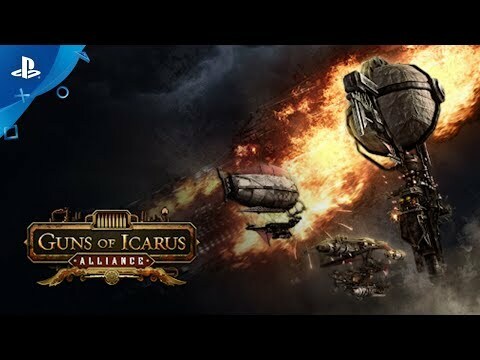 Guns of Icarus Alliance is all about teamwork. No one member of the crew can carry a match, and there are no individual life bars. The ship serves as the crew’s shared life, and maintaining the integrity of the ship while dealing damage to an enemy’s ship requires communication and cooperation. You and your crew survive and triumph together, always.